Air India career opportunity for all Indian candidates, who are wishing to work for Air India as a cabin Crew members. This is a great opportunity for all Indian candidates who want to make their career in Air India. Air India recently launched an official notification on their official website related to the Air India Recruitment for cabin crew members. We took all this information related to the Air India career opportunity from that official file of notification. Air India is going to recruit Male/Female Cabin Crew members for its Northern Region on contract as well as on regular basis. Those who are looking for this Air India Career opportunity have to read this article very carefully before applying, because we explained each and everything related to this Air India Recruitment 2018. Read the official Notification carefully before applying. Job Profile: Cabin Crew Members. Age Bond: Those who are going to apply for Experienced Cabin Crew posts must have age in between 18 and 35 Years while for the candidates who are applying for Trainee Cabin Crew must have age in between 18 and 27 Years. Note: The relaxation of age is up to 5 years in the case if candidates belongs to the SC/ST category and 3 years in case of OBC category candidates. Fee To Apply: Those who are looking for this Air India Career opportunity and wish to apply have to pay the application fee, which is as follow: “Gen/OBC – Rs.1000 and SC/ ST/ Ex-Servicemen – Nil” . Procedure for the Selection: Indian candidates who are wishing to get a career opportunity in Air India have to crack the written examination conduct by Air India recruitment department. The written examination will contain the following subjects: “Math’s, reasoning, GK and English”. So practice hard before appearing in this examination. One of the great career opportunity for all Indian candidates. Dear candidates all the best for written examination. After clearing the written examination conducted by the Air India, candidates have to go through the interview round for the final selection. Those who cleared these both round of selection will be recruited as cabin crew members under Air India. Procedure for Applying Air India Career Opportunity: Indian candidates, who fulfill all eligibility criteria which we explain above, can apply for this Air India Recruitment process to make their bright career in Air India as a cabin crew member. Interested applicants have to apply online through the Air India official website; we also share the direct link below for the application form. Visit to the important link section below to get the official notification as well as for the Online application form. 12th April 2018 is Starting Date to Apply. 2ND May 2018 is the Last Date to Apply. 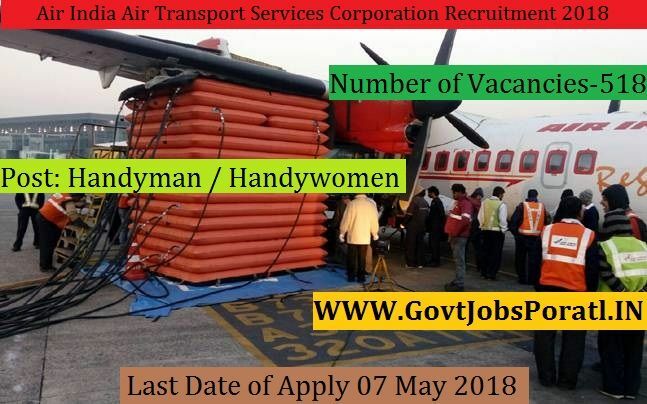 Air India Air Transport Services Corporation is going to recruit fresher candidates in India for Handyman / Handywomen Posts. So, those candidates who are willing to work with this organization they May apply for this post. Last Date of Apply 07-May-2018. Total numbers of vacancies are 518 Posts. Only those candidates are eligible who have passed 10th, 12th, Diploma, B.Tech, MBA, Graduate, from a recognized university Or Relevant Qualification. 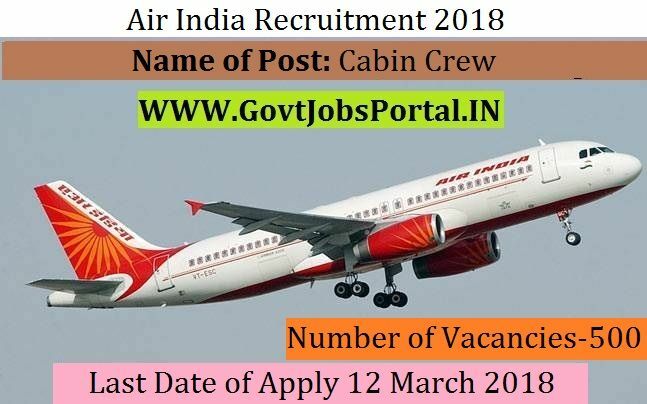 Indian citizen having age in between 17 to 28 years can apply for this Air India Air Transport Services Corporation Recruitment 2018. 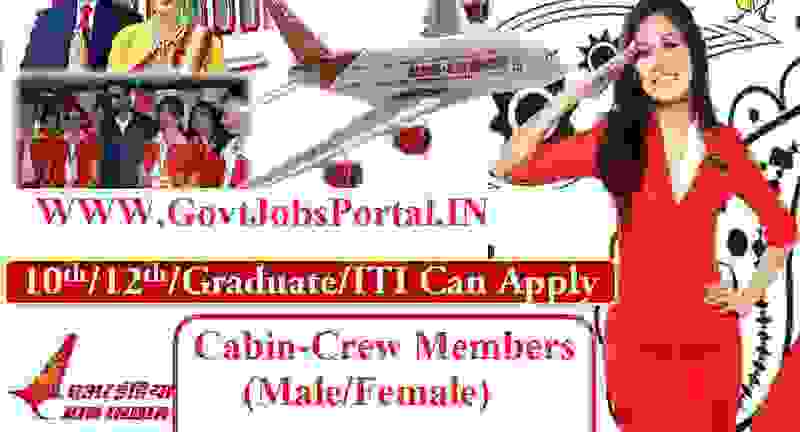 Those who are interested in these Air India Air Transport Services Corporation jobs in India and meet with the whole eligibility criteria related to these Air India Air Transport Services Corporation job below in the same post. Read the whole article carefully before applying. Educational Criteria: Only those candidates are eligible who have passed 10th, 12th, Diploma, B.Tech, MBA, Graduate, from a recognized university Or Relevant Qualification. What is the Air India Selection Process job? 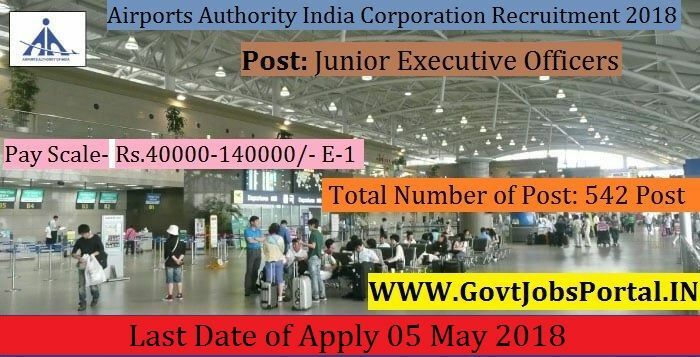 Airports Authority India Corporation jobs has published Employment News for Indian Junior Executive Officers Posts. Interested and eligible candidates can have online application scheduled from 27-April-2018 Online can be registered online on the official site, all candidates are requested to submit all necessary employment related information before applying for this government job. Total numbers of vacancies are 542 Post. Only those candidates are eligible who have passed Bachelor’s Degree in Engineering/Technology with minimum 60%marks in Electronics/ Telecommunications/ Electrical with specialization in Electronics & Bachelor’s Degree in Engineering/Technology in Civil with minimum 60%marks. Indian citizen having age in between 21 to 32 years can apply for this Airports Authority India Corporation jobs Recruitment 2018. Those who are interested in these Airports Authority India Corporation and meet with the whole eligibility criteria related to these Airports Authority India Corporation jobs below in the same post. Read the whole article carefully before applying. Educational Qualification: Only those candidates are eligible who have passed Bachelor’s Degree in Engineering/Technology with minimum 60%marks in Electronics/ Telecommunications/ Electrical with specialization in Electronics & Bachelor’s Degree in Engineering/Technology in Civil with minimum 60%marks. What is the Selection Process for these Airports Authority job? What is the Application Fee for these Airports Authority Jobs in India? Airports Authority India Corporation jobs has published Employment News for Junior Executive Officers Posts. Interested and eligible candidates can have online application scheduled from 27-April-2018 Online can be registered online on the official site, all candidates are requested to submit all necessary employment related information before applying for this government job. Total numbers of vacancies are 542 Posts. Only those candidates are eligible who have passed Bachelor’s Degree in Engineering/Technology in Civil with minimum 60%marks & Bachelor’s Degree in Engineering/Technology with minimum 60%marks in Electronics/ Telecommunications/ Electrical with specialization in Electronics for these Government jobs in India. Indian citizen having age in between 18 to 32 years can apply for this Airports Authority India Corporation jobs Recruitment 2018. Those who are interested in these Airports Authority India Corporation jobs in India and meet with the whole eligibility criteria related to these Airports Authority India jobs below in the same post. Read the whole article carefully before applying. Educational Qualification: Only those candidates are eligible who have passed Bachelor’s Degree in Engineering/Technology in Civil with minimum 60%marks & Bachelor’s Degree in Engineering/Technology with minimum 60%marks in Electronics/ Telecommunications/ Electrical with specialization in Electronics. Age Criteria: The Contestants applying for the post should be existing between 18 & 32 Years. Air India is going to recruit fresher candidates in India for Utility Hands Posts. So, those candidates who are willing to work with this organization they May apply for this post. Last Date of Apply 12-March-2018. Total numbers of vacancies are 60 Posts. Only those candidates are eligible who have passed VIII with minimum 60% (55% for SC/ST/PWD) marks in any discipline from a recognized University. Indian citizen having age in between 20 to 55 years can apply for this Air India Recruitment 2018. Educational Criteria: Only those candidates are eligible who have passed VIII with minimum 60% (55% for SC/ST/PWD) marks in any discipline from a recognized University. Air India is going to recruit fresher candidates in India for Cabin Crew Posts. So, those candidates who are willing to work with this organization they May apply for this post. Last Date of Apply 12-March-2018. Total numbers of vacancies are 500 Posts. Only those candidates are eligible who have passed 10+2 from a Government recognized Board/ University. Indian citizen having age in between 18 to 35 years can apply for this Air India Recruitment 2018. Educational Criteria: Only those candidates are eligible who have passed 10+2 from a Government recognized Board/ University. 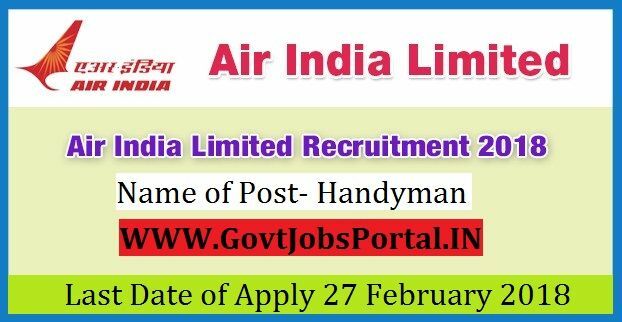 Air India Limited is going to recruit fresher candidates in India for Handyman Posts. So, those candidates who are willing to work with this organization they May apply for this post. Last Date of Apply 27-January-2018. Total numbers of vacancies are 98 Posts. Only those candidates are eligible who have passed must have minimum experience of six months at Chennai Airport in any of the areas or combination thereof, of Terminal Functions, Ramp Functions like Baggage/ Cargo/ Loading/ Unloading and Aircraft Cabin Cleaning area with any Airline or Ground Handling Agency. The candidate should hold a valid AEP. 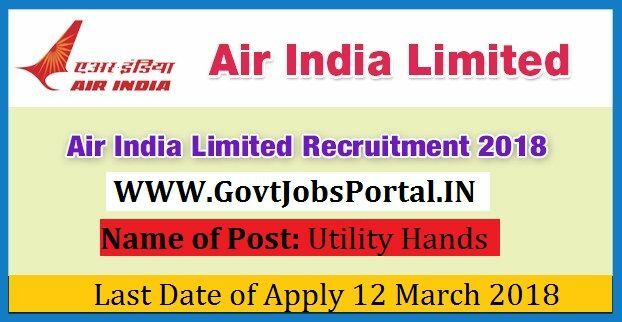 Indian citizen having age in between 18 to 28 years can apply for this Air India Limited Recruitment 2018. Educational Criteria: Only those candidates are eligible who have passed must have minimum experience of six months at Chennai Airport in any of the areas or combination thereof, of Terminal Functions, Ramp Functions like Baggage/ Cargo/ Loading/ Unloading and Aircraft Cabin Cleaning area with any Airline or Ground Handling Agency.